The landing page for The Old Spaghetti Factory menu prices. The Old Spaghetti Factory is a restaurant that offers classic spaghetti and has been doing this successfully since 1969. They are regarded as an institution in the restaurant industry and are still serving the best spaghetti in 40 locations in the United States, 14 stores in Canada and one in Japan. The Old Spaghetti Factory still serves their famous 3 Course Meal with hot baked bread, soup or salad. The Factory Insider Program is the place for exclusive members-only offers and insider information. Below are the latest The Old Spaghetti Factory menu prices. Their specialties include classics like the Italian Sausage with Meat Sauce and Mizithra Cheese & Browned Butter. For only $8.25, they offer The Manager’s Favorite or a pair of any the classic sauces to create a great combination. The alternatives are the rich meat sauce, mushroom sauce, white clam sauce, Mizithra cheese and browned butter or Marinara Sauce. This classic restaurant chain also serves a delicious lemon cilantro shrimp salad and a Caprese Panini for only $8.25 each. They can also host banquets, events like birthdays or company parties. The Old Spaghetti Factory retains their classic and old-school ambiance by setting up shops in old warehouses and historic locations. Their fixtures include antiques, chandeliers, headboards, and footboards. All of their restaurants have a streetcar as a centerpiece. 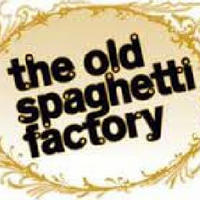 For more information about Old Spaghetti Factory, visit their official website. Does The Old Spaghetti Factory offer a gluten-free menu? Yes, The Old Spaghetti Factory does offer a gluten-free menu that includes a selection of pasta dishes, salads, and sides. Can you buy branded merchandise from The Old Spaghetti Factory? Fans of The Old Spaghetti Factory can purchase branded items such as caps, T-shirts, and tumblers from their website.